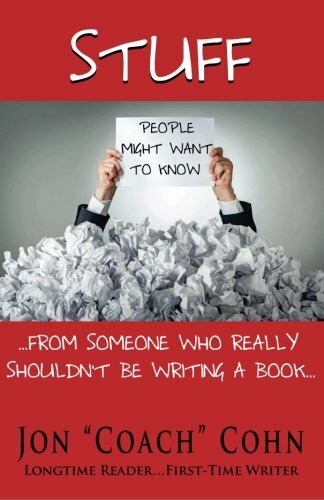 “STUFF People Might Want to Know: From Someone Who Really Shouldn’t Be Writing a Book” by Jon “Coach” Cohn is a compilation of his thoughts, opinions and observations about random topics he has pondered over the years. Like many of us, some of these thoughts have crossed all our minds as well. The topics of Eating for Epilepsy, Drinking for Dystrophy and other fundraising events provide excellent advice. Instead of dressing up and socializing with other well-to-do individuals and writing a check for large amounts why not roll up your sleeves and get down and dirty helping? Recently in the news with all the natural disasters, you see very few celebrities or politicians helping in any way. Some did go down to devastated areas and provided actual supplies, private planes or boats to evacuate the most medically fragile. How many of us have done that? I had to laugh on his musings about consultants. I, like the author, have yet to figure out what a consultant is and how they got that title. So many of them, it seems to me, have never been in the field and rely solely on their degrees and opinions. So we pay thousands of dollars for their thoughts when most of those in the field already know what the problem is and how to fix it. Given that most schools or cities are cutting their budgets, it seems it would be more beneficial to enlist the help of those who know the situation best. That includes analysts on sports, war, and mass shootings. The chapter on standing for the national anthem for me is a time to think about those who gave their lives so we can be thankful for all that we have been given. I am a military brat, married a soldier and worked for the military as a psychologist for 35 years. Even today my family and I stand, take off hats and put our hand over our hearts. Look closely at parades, sporting events and ceremonies dedicated to the military- who stands, claps, or gives a moment of silence? Very few. The author provides some great opportunities to laugh, reminisce on various topics we have all thought about or wondered, “Why did they do that?” “STUFF People Might Want to Know: From Someone Who Really Shouldn’t Be Writing a Book” by Jon “Coach” Cohn is very easy reading filled with humor and great suggestions.